One night about a week ago, the family went out to the drive-in (yes, again). We really enjoy the ability for the entire family to go see two movies in one night for only 10 bucks. When we looked it up online we saw that Evan Almighty was showing followed by Surf’s Up. We were mildly disappointed when we showed up and realized that the showings online were for the following day. We ended up seeing Evan Almighty and then watching about half of Shrek the Third. I finally talked Emily into leaving about halfway through the second movie. It was a weeknight and I had to get to work the next day by 8. Don’t feel too bad because this was the second time we had seen Shrek the Third. 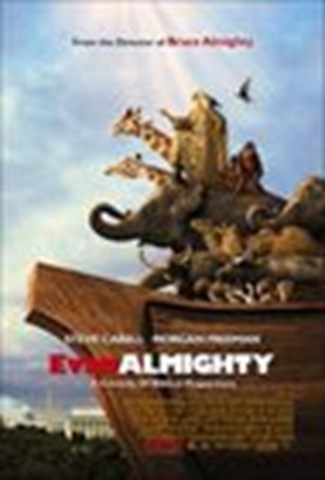 Lori mentioned to me that James Dobson did a review of Evan Almighty and did not recommend it as a very good show especially for the Christian family. The premise of the story is that God appears to Evan Baxter (played by Steve Carell) who is a return character from the earlier flick, Bruce Almighty starring Jim Carey. God is played again by Morgan Freeman. According to Lori, who actually read the review by Dobson, one of his primary critiques was of the misconception of God portrayed in this character. I can’t comment directly on the review since I haven’t read it, but I must say that I like some of the traits I see in the character. Obviously this is a comedic work of fiction and we can’t expect a comprehensive theology coming through in the character development but there is an approachableness to the character that I believe should be recognized in our Heavenly Father. He is involved in each one of lives in a very individualistic way. He has a concern for our well-being and for our happiness. Now, what a secular movie will obviously miss is that our Heavenly Father knows that true happiness, lasting happiness comes only from the joy that he gives through our personal and intimate relationship with him. The only avenue to that relationship is through the forgiveness and grace provided through the Cross of Christ. Nevertheless, that God knows us and is concerned with us, answering prayers that teach us through His mysterious ways. I believe that to be an honest reflection of that side of God. But, back to the work of comedic fiction on the big screen, I loved it. I thought it was very funny. How could I not with the funniest comedian on the small screen? Just so you know, I am a huge Steve Carrell fan, having not missed a single episode of the Office. He doesn’t let me down in this flick, keeping me laughing or at least smiling almost the entire flick. Some may want a little more of his characteristic comedy as the movie develops but I really enjoyed it all the way through. Plus, I like the lesson of a man putting his family as a priority over the demands of the world and his career. I was surprised to read this week that it is doing so poorly at the box office. Being the most expensive comedy ever filmed (over $200 million) you might expect it to do well but it doesn’t look like it will even clear $100 million. Bummer. Maybe I should go see it a second time just to help it out. Would an extra 8 bucks make a difference? I guess it doesn’t help that we are bargain hunters going only to drive-ins for less than 2 bucks a person. I give it a hearty recommendation and 4 out of 5 stars. ← Do you know where your kids are?